Last edited by tomstwincam on Sat Aug 31, 2013 3:27 pm, edited 1 time in total. 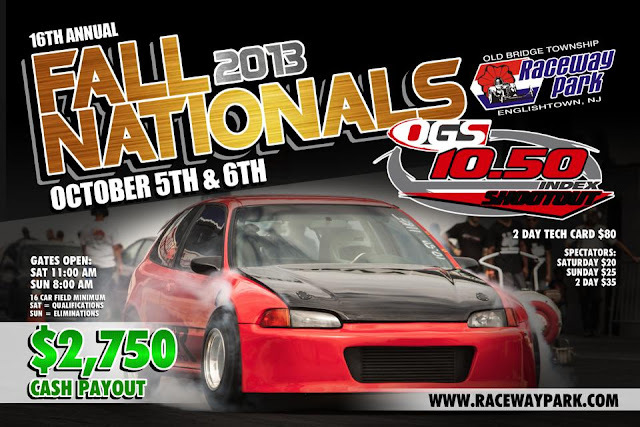 On October 5th and 6th Englishtown Raceway Park along with Ortega Global Solutions is proud to bring to you the 16th Annual Sport Compact Fall Nationals. One of the many competitive classes at this event will be the Quick 32 class. 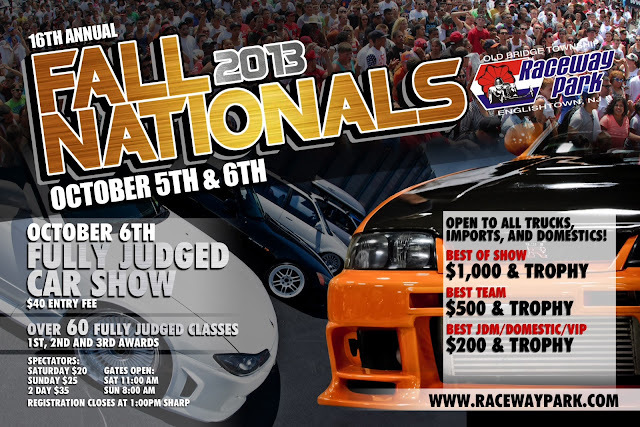 This class will feature the fastest cars in attendance, competing for a $12,000 purse!!! 32 cars are required for a full payout. Open to AWD, RWD, FWD, Hot Rod, Pro FWD Trim only. 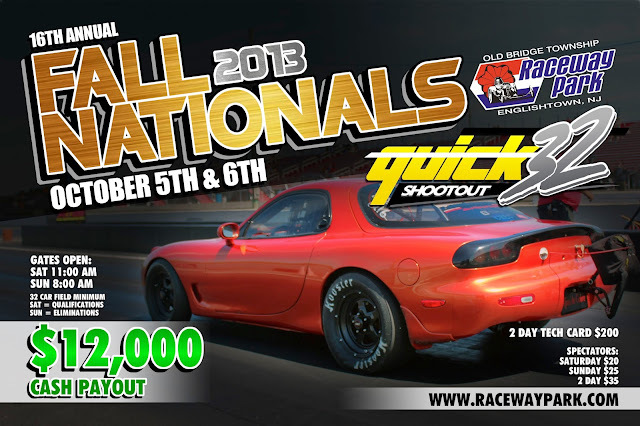 Rotary, 4 & 6 cylinder Import / Domestic Sport Compact Motors & Import V8 power plants OK. (i.e. Toyota, Nissan). No year limitation on full tube chassis or back half. .500 Full Tree, 32-car field, Bracket style eliminations. Random pairings in Round #1. Tech Card cost will be $200. This will cover the car and the driver. 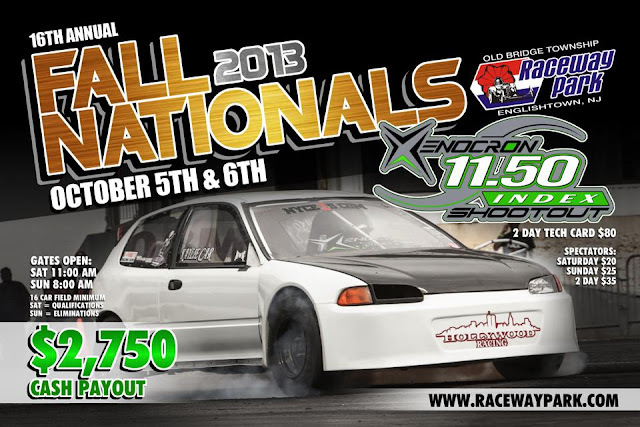 Open to all Import/Sport Compact Cars 10.99 or quicker. Any combination & any weight. No Deep Staging, Throttle Stops, Delay Boxes or Sandbagging. All-Run field .400 Pro Tree. Sportsman Ladder. Tech Card cost is $80. Includes the car and driver. Open to all Import/Sport Compact Cars 11.99 or quicker. Any combination & any weight. No Deep Staging, Throttle Stops, Delay Boxes or Sandbagging. All-Run field .400 Pro Tree. Sportsman Ladder. List of the cars confirmed by the owners for the Quick 32 class competing for the $12,000 payout! There are a few more confirmed that did not want to be posted on the net and also a couple of cars that we are waiting to hear back from.